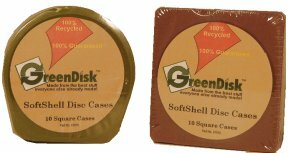 To ensure a better future for your discs use soft cases with a past. Plastic CD jewel cases tend to break if you even look at them hard. And sometimes you get CDs that have never been inside a jewel case. Yet they are still the best way to store and protect your CDs or DVDs. Without them they wouldn't have much of a future. Now you can replace all the cases you are missing with GreenDisk Recycled Soft Cases.